Throwing Oreos into a chocolate chip cookie is brilliant. 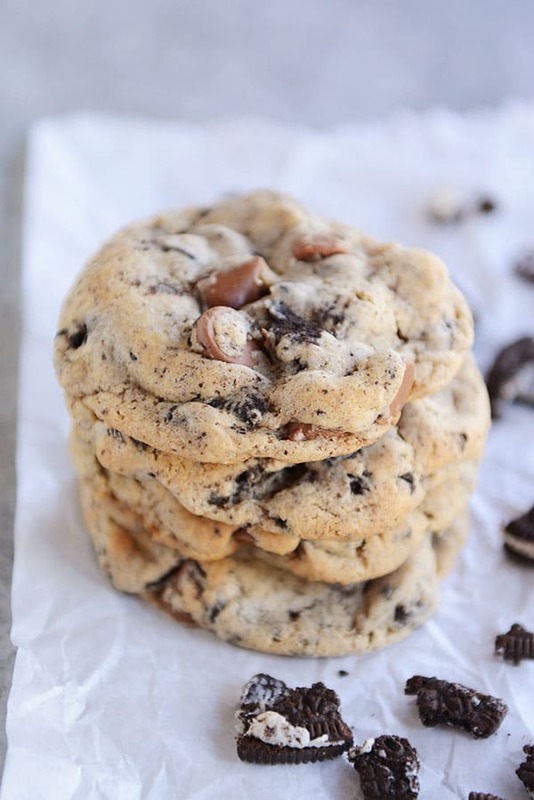 These Cookies and Cream Oreo Chocolate Chip Cookies are so fun and amazingly delicious! There are cookies. And then there are cookies. If you know what I mean. 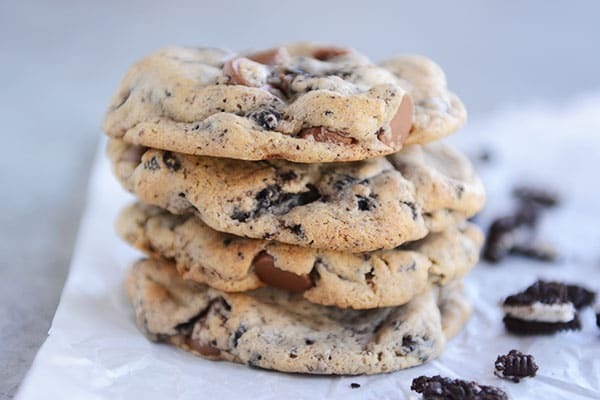 These cookies and cream Oreo chocolate chip cookies are in the second category, and they have stolen my heart…and the hearts of about 200 other people in my surrounding area (I’ve made them four times over the last month for large gatherings and the recipe requesting has been at an all-time high). Each time I’ve made them, I’ve tweaked the recipe just a little – trying a few different ingredients to see if the change would really make a difference. You’ll know what I’m talking about with a quick glance at the recipe and some of those special ingredients. I’ve definitely settled on a favorite version. It’s rare a recipe goes up on here without me making it at least twice, but usually it’s more like three or four times. These Oreo chocolate chip cookies are no exception. Of course no one was complaining as I churned out batches. They are unique and dangerously delicious. The cookie is ultra-creamy – almost velvety in texture – thanks to the cream cheese taking over part of butter’s normal chocolate chip cookie duties. And of course the tasty Oreo morsels crumbled in don’t hurt things at all either. These cookies rank even higher on the delicious scale because of the malted milk powder. It’s not overly malty (so if you are a malt hater, never fear); instead, it’s a beautiful accent of something slightly creamy and a little different, and it adds a delicious flavor to the cookies. As noted below in the recipe, don’t be tempted to omit the malted milk powder OR sub in instant nonfat dry milk powder. I tried both of those things. Disaster. The instant nonfat dry milk leaves a not-so-pleasant after taste that you just don’t want. Having said that, I HAVE subbed in whole milk powder for the malted milk powder and talk about a creamy cookie! So, so delish. I know specific, fussy cookie recipes are a bit of a pain in the ol’ rumpus, but you have to trust me on this one. The results will be worth it if you stick with the right ingredients. I believe you can get malted milk powder fairly easily at some grocery stores, but because my only goal in life is to be BFF’s with our UPS driver, I always order my malted milk powder (and the whole milk powder) on Amazon. Feel free to source yours locally or elsewhere online. We use our fair share of malted milk powder so I like to keep it on hand. 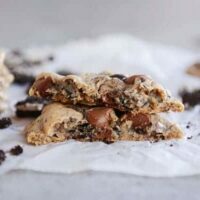 I have several other cookie recipes I use the malt and whole milk powder in – if you have the Momofoku Milk Bar cookbook you know what I’m talking about. I also have a pretty stellar malted brownie recipe (I’ll share it if enough people want it! ), and our most favorite thing to do is just throw the malted milk powder in the blender with chocolate ice cream and a little milk for delicious chocolate malts. 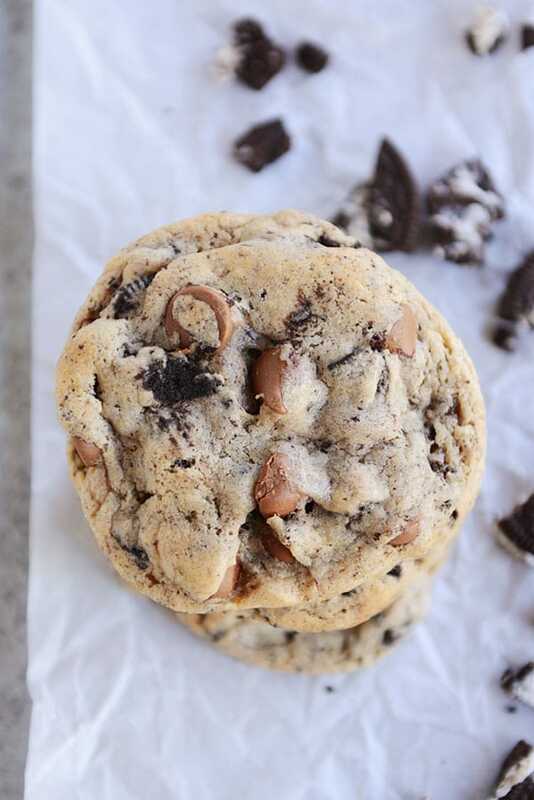 Basically what I’m saying is: get your hands on some and make these cookies and cream Oreo chocolate chip cookies. 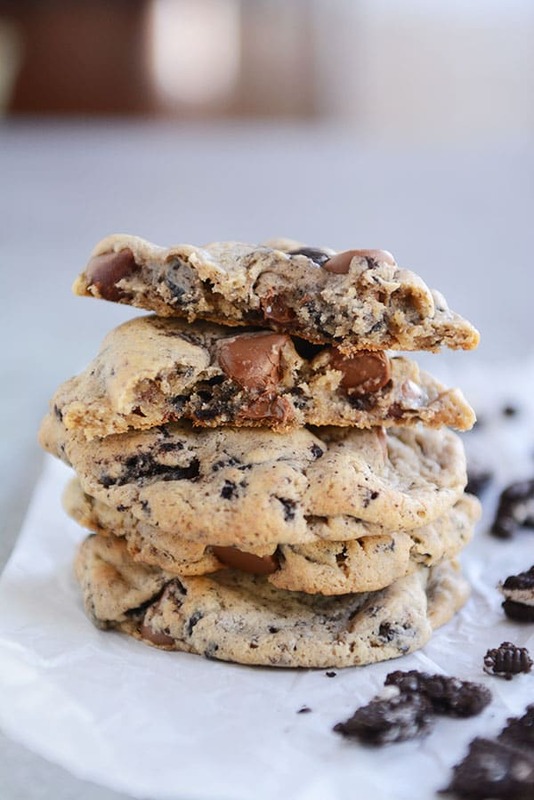 The combination of creamy + soft dough, Oreo cookies, and chocolate chips is mighty delicious. If you know me, you’ll be a little shocked to see milk chocolate showing up in my cookies. I’ll confess, it hurt a little to throw them in there instead of my beloved bittersweet or semisweet, but the consensus of all my taste testers (and trust me, there were a lot) was that the milk chocolate won over the semisweet. I don’t necessarily agree with that, but I’m also open to other people having opinions. I’ll let you use your best judgment. Either way, I think you’re going to fall in love. Preheat the oven to 350 degrees F. Line baking sheet(s) with parchment paper or silicone liners. In a large bowl with an electric handheld mixer or in the bowl of an electric stand mixer fitted with the paddle attachment, cream together the butter, cream cheese and brown sugar until well combined. Add the vanilla and eggs and mix until the color lightens and the batter is fluffy, 2-3 minutes. In a separate bowl, whisk together the flour, malted milk powder, baking soda, baking powder and salt. Add the dry ingredients to the wet and mix until just combined. Stir in the Oreos and chocolate chips. Roll the dough into 2-3 tablespoon size cookie dough balls (I use my large, #20 cookie scoop). Place them several inches apart on baking sheets and bake for 11-13 minutes until the edges are golden but the centers are still soft. I love the very slight hint of malt taste from the malted milk powder. I've also made them with whole milk powder and the cookies are extra creamy and delicious. Leaving out the malted milk powder/whole milk powder will affect the taste, texture and consistency of the cookie dough - so I don't recommend it. I tried the cookies using nonfat instant dry milk (I have a ton of it in my food storage); a friend that taste tested them said they were "fine" but I'll be honest, I thought they were super icky terrible. So. It's malted milk powder or whole milk powder all the way, in my ever so humble opinion. I buy both malted and whole milk powders from Amazon (details up above in the post). Don't get too eager crushing the Oreo cookies in preparation for the recipe. 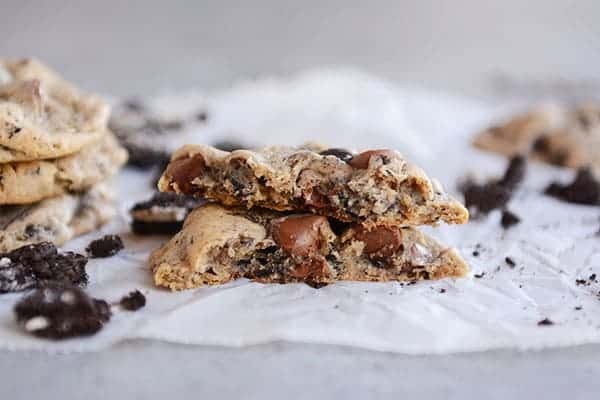 They should be coarsely chopped - not pulverized - so you can get a nice taste of real, live pieces of Oreo cookie inside the chocolate chip cookie. My favorite method? Taking the whole Oreo/Jo-Jo cookies in my hands and crumbling them over the top of the dough (so each Oreo cookie is probably in about 4-5 pieces). Disclaimer: there are a few Amazon affiliate links up above in the post for the malt and whole milk powder (that’s where I’ve bought the ingredients from); feel free to shop around locally or elsewhere online! These were DIVINE! I’ve made them twice and the cookies just get inhaled. My new favorite cookie to make!! My husband and I are just wrapping up Whole 30 (30 days with no refined sugars, grains, etc.) I made these last night for a potluck he had a work. We made a pinky swear we could cheat together last night (we end tomorrow) and indulged in one cookie. They were so yummy. We both loved them and were completely satisfied with just one (usually I eat cookies by the dozens). He sent me a text this afternoon stating the cookies are the hit of the potluck. I sent him with 22 (since we ate two) gave the extra dough to my BFF running friend this morning. She baked them up for her kids to have in their lunches…apparently they had them for breakfast too because she texted to say they are a new favorite. Yum! Can’t wait for the malted brownie recipe. 🙂 Thanks for another tasty cookie winner! The idea of crushing store-bought cookies and adding them to home-made cookies sounded strange to me, but my husband decided to make these. They were delicious! Thank you! We shared them with friends and I was amazed by how fast they were disappearing. Yummy! I wasn’t a huge fan of them right out of the oven but completely cooled and even the next day they are tasty. I ordered the malted milk powder from Amazon and boy oh boy am I glad I did. These cookies are ridiculously delicious!!! Thanks again, for great recipe!!! I made these the other day and my grandkids loved them. I’ll try to make a batch and freeze them if I can do it without my family finding out. That will be the trick. Please publish the malted brownie recipe!! I can’t wait to try that, and these cookies! Hi Mel! at what stage would you freeze them? before you bake or after? I did freeze them – worked great. These were a hit. Is the brand of malted milk powder you link to the one you like to use? Yep! That’s where I buy it from. I would love to see the malted brownie recipe! I’m a malt fanatic. Our local ice cream shop sells hot caramel malts. Try it. It’s amazing! Consider me interested in the malted brownie recipe. It seems important. I would love the brownie recipe. I love anything malted. Ooh, fun! I’ve been taking your chocolate chip cookie recipe, throwing in crushed ores, a mix of regular and white chocolate chips and rolling them in oreo dust for a year or two. I can’t wait to try this new and improved version! These look fabulous, and I’m excited to try them. I would love to have the malted brownie recipe. My husband LOVES malt flavor and while he isn’t a chocoholic like his lovely bride, brownies are usually acceptable on the chocolate spectrum. This just went on our new treat weekly recipe list. Can’t wait to try the cookies!! Have your tried 1/2 malted milk powder and 1/2 whole milk powder? I am wondering about that possibility. In all my testing, I never tried that but I bet it would be delicious! I live in a country where malted milk powder is not available (and shipping from overseas is not an option)– do you think Ovaltine powder might work? Thanks! Ovaltine has added sugar so I’d think you’d need to adjust the recipe to accommodate, if nothing else. I had the same thought as I was going through all the variations of these but I think Allegra is right – the added sugar might mess with the overall flavor, but you could definitely experiment and see. I don’t think Ovaltine has quite the creamy kick as the malt or milk powder. I just used Ovaltine because that’s all I could get. I don’t know what they’re “supposed” to taste like, but I thought they were good.